The top edge of a kete can be finished in many different ways and the one you choose will depend on the look you’d like for your kete. In this little kete I wanted undyed variegated flax to be the main feature, and this already made the design a bit busy, so I used a simple straight edge on the top. (Incidentally, although the colour of variegated flax will fade, the variations in tone will still be visible when it is faded). Whether the kete is finished with a simple straight edge or in a more complicated way, it always looks best if it is finished neatly and evenly. This method, demonstrated by Cath Brown in a video I watched recently, gives a finish that looks both professional and attractive, as well as keeping the pattern of the weave intact, so I thought it was worth reproducing. Weave the kete to the height you want it. Start the straight edge by folding one of the top strips that is pointing up to the right, back on itself, so that it is lying pointing downwards to the left. Miss one strip along the top edge and take the next strip pointing up to the right, pull it out from underneath the strip it is lying under and fold it back down across the same strip that the first one is folded down on. The strip that is pointing up to the left is now lying alongside the fold of the second strip that was folded back, over the strip that was missed and alongside the fold of the first strip that was folded back. Bring the first strip, that was folded back, forward again and then bend it downwards at an angle to the right so that it lies over the top of the strip pointing up to the left. Bring the second strip, that was folded back, up again to lock this strip in place. You will repeat this set of steps right around the top. Start the next set of steps by folding back the next top strip, and the third one along, as in the first step. Continue with the rest of the steps. Then repeat this set of steps until you come back to the beginning. The first part of the straight edge is now finished. The strips you have folded down have formed a straight edge around the kete and there will be strips pointing up to the left all the way around. The strips lying up to the left now need to be woven back down into the body of the kete. Take one of these strips and fold it down to the left, over the fold of the strip in front of it, and then thread it underneath the strip next to this one. Thread the strip down one more time through the next available strip. Complete this all the way around the top of the kete. Finish by simply cutting the ends off, or embellish the kete by fringing the ends or plaiting them around the kete. If you’re interested in watching this video featuring the late Cath Brown, it is available through NZ libraries - 746.41 NZ RAR. It was made in the 1990s as a teaching resource for students at the Christchurch Teachers College. As well as providing a glimpse of how a very experienced weaver works with flax, including using her feet and toes to hold the flax in place, the video also shows Cath weaving a floor mat and a basket in a Pacific Island style. Hi. I followed a link from Weaving Spirit to visit your blog. Your work is amazing. I’ve always admired basket weaving, but am not sure I’d have the patience. My floor loom requires all I’ve got as it is. The book “Maori Weaving” by Erenora Puketapu-Hetet, that I’ve reviewed on the Reviews page of my website, has instructions for making a simple kete. Your local library should have a copy for you to borrow. Good luck with the weaving! the colour will penetrate better? I am doing it too many time so it curls slightly? It’s very nice to hear from you. I’m so pleased you’ve carried on with your weaving and have enrolled to learn further. As far as the dyeing is concerned, you’ll get a truer colour if you boil the flax first and then dye it, or if you boil it, dry it and let it bleach in the sun and then dye it. The final dye colour is usually not fully evident until the flax is completely dry, which can take several days. There are several things that can affect whether you get gaps in the weaving or not. It is better to scrape the flax quite a lot to soften it and remove some of the moisture and it will be curled once you’ve scraped it. The removal of moisture is one thing that will help to prevent gaps. If you use the flax when it’s just picked, especially in the winter time, or quite damp from dyeing, it will still have quite a high moisture content and so will shrink more as it dries. I often scrape the strips and then leave them for an hour or two to dry a bit before I weave with them, which also helps to keep get rid of some moisture. Finally, make sure that when you’re weaving (using the weaving technique I included in the instructions for the two-cornered kete) you keep a bit of a tension on the strips as you weave them. By that I mean that as you do the weaving steps, pull the strips up to tighten them, and make sure they are sitting at a forty-five degree angle. This keeps the tension tight and will give your kete a good even shape. Best wishes with your weaving and do keep in touch. I’d be interested to hear how you’re going. I would like instructions for the double lock off. can you please send them to me. What a lovely website you have. thanks very much, I am a recently hooked weaver!!! Thanks very much for your comments about the web site. You’ll find instructions for the double lock on pages 72 to 73 of Mick Pendergrast’s book, “Te Mahi Kete”. This book is in local libraries or you can purchase it from Amazon or Collectiblebooks. You can find instructions for making a simple two-cornered kete in the book “Maori weaving” by Erenora Puketapu-Hetet that I mention on the Reviews page of my web site. The book is available from local libraries. Although I do show people how to make this sort of container in my workshops, I don’t have any written instructions for it as yet. I suggest you contact the tutor of your workshop and see if she does. Good luck! I was really happy to find your site. I’ve been weaving for a number of years but only learnt the basic kete. I would like to know if you are aware of anyone in South Auckland that holds workshops etc so I can expand on my knowledge to learn kete whakairo, whiri-top backpacks, and some better ways of doing handles etc. No, sorry, I’m not aware of anyone in your area. I suggest you contact Toi Maori Aotearoa and see if they know of anyone who can help you. Kia ora! I just want to let Zara know that there is help available in South Auckland. Google TWOA, Te Waananga o Aotearoa and check out their subjects. I am at the end of year 1 of a 3 year course, Toi Paematua Raranga at Level 4 and it has been great. I hope you would be learning in the same whanau environment as I do also as it is really special. We started from the basic toys and ornaments, flat kete and rourou, kai kete, four corner kete, taaniko, flat-base kete to pikau - back pack. Along the way we learned the culture and traditions associated with harakeke. At the end of 3 years we will have a diploma. You can continue on to higher goals from here. Next year is even better. Also, thank you Ali for your site which is so helpful. There is always something to learn with weaving. Arohanui, Anita. Thanks for your useful information Anita. It sounds as if you are really enjoying your course. Hello are you able to tell me how to make a loose weave flax rose please? I am learning to make kete whakairo with the hope of eventually learning whariki,however I find the joining at the bottom difficult, do you have instructions for this please? Sorry but I don’t have any written instructions for this. The join does depend on how you are weaving the kete too. I start a kete whakairo with a plait at the bottom and so don’t join it at the bottom after weaving it. There are instructions in Mick Pendergrast’s book ‘Maori Fibre Techniques’ on my Reviews page for joining a whariki but it is different from the way I would join a kete at the bottom. Ali, how do you souce Rit dye here in New Zealand. Is there someone who will sell it on. You can buy Rit dyes online from Wainhouse Distribition Ltd. They are the the sole New Zealand agent for importing the range and can supply to any interested parties in New Zealand. Thanks for the response, I do enjoy comments from you and anyone else who has helpful hints! What a great site, Can you advise where I could get instructions on making the rose please. Hi Ali, just made my first putiputi ever, much easier than what I thought because of your clear explanations, thanks. I had been given one and always wanted to do some flax weaving, so this present was the trigger and I was told that you always offer your first work or putiputi as a gift. Is this custon right, I have not seen that on your website. I’m glad you found the instructions were clear to follow. Thanks for letting me know. Yes it is part of custom to offer your first piece of weaving as a gift. You’ll see information on this and other Māori customs associated with weaving flax on the Gathering flax page on this web site. can someone tell me how to start the brim on a flax hat once the top part is complete? To make the brim for a hat, you need to add extra strips all the way around so that the weaving can be pulled out into the brim shape. There are instructions for making a hat in Mick Pendergrast’s book, Te Mahi Kete, which I’ve mentioned on the Reviews page of this web site. Thanks Ali. I have seen the book a couple of years ago but never took any notice of hat making. Now of course I don’t have the book and the Nelson library doesn’t have a copy. Guess it’s time to experiment. Could be an original. Yes, I find experimenting great fun and a good way to learn. If you add in about a quarter more strips of the total number of strips you used for the crown of the hat, you should get enough for the brim. Send me a photo when it’s finished - I’d love to see it. The kete edge you show on your website, is this done inside out and then turned outside. Just wanted to know. The edge on the kete on this page is done on the outside. It makes a very tidy edge, doesn’t it? I am very keen to learn flax weaving and was wondering if you will be holding any workshops in nelson in the near future? I’m not holding workshops in Nelson but Maureen Harte does offer workshops in Golden Bay. I currently don’t have any written instructions on starting a kete but you can find some instructions in the book Maori Weaving by Erenora Puketapu-Hetet which I mention on my Reviews page. Your local library should have a copy of it. I hope this helps you to get started. Hi Ali I have been reading all the tips, I have been weaving for awhile but arthritis has seeped into the ole bones and now i just do a few puti puti. Hi Ali what a wonderful site you have.I just kinda stumbled onto it tonight, and I am blown away by everything, and all the comments everyone has said and asked.I would love to be added to your site. I’ll add you to my email list so that you know when a new blog post is up. It’s good to be able to still do a few putiputi isn’t it? They do make great gifts and people always seem to enjoy them. Thanks for your comments. It’s good to hear that you’ve read some useful comments on my web site. Can anyone tell me how to makeflax roses the differant types I can do the woven one but would like to know more I am in Australia these things are not available Instructions I mean can you help? Thankyou. First of all, I think this website is awesome!! Thanks heaps for all your recommendations regarding books that will help out.. I was just wondering, when we boil the harakeke, is it best to do it outside? I noticed in your picture next to the description that it was done outside? It’s fine to boil the flax inside or outside. It doesn’t matter which. Wonderful website, so great to see your sharing your gift and your respect for the tikanga involved in weaving. I was wondering if you know of any workshops or people teaching the art in the Thames, Coromandel area? I did a workshop during Maori Arts week in Thames, which has me hooked and would love to learn more. I have information about Courses and Tutors on the Links page of this web site. You may find a course there that suits you. * If anyone knows of any other courses, please let us know. I’m interested in learning how to weave a kete but, alas, I live halfway around the world, in Canada. Flax does not grow here and I have been trying to find something that will work in the same way. If a kete weaver travels to this part of the world, I’d be glad to meet them. I’ve tried to learn from a book but that doesn’t quite work for me. Merci. 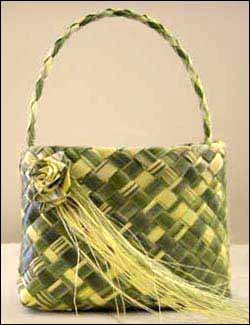 Hi, I am wanting to do the patikitiki pattern on a flat bottom kete. i have dyed 36 whenu and boiled 36 whenu, counted the pattern is 9 so it will add up, then just noticed the layout says “dextrals wwbwbwbwb sinistrals ditto” does this mean the sinistrals will also be wwbwbwbwb? or the opposite bbwbwbwbw? i am not going to have enough white. and also would the pattern even come out properly on a flatbottom kete? It’s a bit confusing, isn’t it? I’m not an expert in kete whakairo, but from my experience, the sinistrals will be placed in the opposite order i.e. bbwbwbwbw. This makes sense as, when you look at the pattern, there are equal numbers of back and white. As far as the pattern coming out properly on a flat-bottomed kete, it will depend on your method of construction. If you are laying the strips into a plait and then making four corners I think you may find the pattern is affected. Hi Ali, l love your website and reading all the interesting topics other weavers send in. l’d just like to know if you use plain salt when you are using Rit dye and also Teri dyes. l had an unusual result when l recently used the Teri black dye, I dyed some nylon rope with the black and added plain salt to the hot mix, and it turned the rope a very interesting.bronzy black colour, all l could think of was ,maybe l added too much salt? I don’t use any salt at all when I dye flax, although I know some people do. I’ve tested dyeing flax with and without salt but couldn’t see any difference between the samples so decided not to use it. I’d suggest that your result with using Teri dye on nylon rope is because Teri dye is formulated especially for flax, which is a natural cellulose material. As nylon is synthetic, it may take up the dye differently. It’s always fun doing dyeing, isn’t it, when you get results that you weren’t expecting. The length of time to make a kete depends on what type of kete you are making and how experienced you are. For a beginner, a simple folded two-cornered kete woven from scratch including preparing your own strips can take about half a day. More complicated ketes can take much longer. What sort of kete are you planning to weave? Heih Ali - whattawieh? I hope your return home to beautiful Christchurch was not too distressing. Hope too that you and yours are all safe. Thank you for coming over to Norfolk Island and conducting the workshops. Soooo enjoyed it. Take care and love from us all over here. All yorlye gwen? I enjoyed my visit to Norfolk Island very much, especially the friendly welcome we received and the way everyone seemed to enjoy the weaving and dyeing workshops so much. Experiencing different weaving materials and different ways of weaving was very stimulating for me too and I have some new ideas for my weaving. Our return to Christchurch was delayed as our flight to Christchurch on Saturday was cancelled. The airline put us up in a hotel for the night in Auckland and we arrived in Christchurch on Sunday morning. My family and friends are all safe but some have been badly frightened by the experience, especially the elderly, and don’t like the aftershocks which we are still experiencing. I have two of my sons staying with me at present as they have no power and water. There is a large hole, big enough to hold a small car, in the road just up from their cottage, and the road is cracked all the way to their place. My other son, who lives in a house bus, said it felt like the bus was going to tip over on its side, it was rocking so much. It didn’t, thankfully. The central city is still closed so no work for me today. Thanks once again for the invitiation. We enjoyed our week in Norfolk very much and I look forward to visiting again! I attended a weaving class a few weeks ago and made a very small korowai which is to be given back to the tutor. I have made another small one but don’t know how to finish off the band around the top. Would you have clear (pictures?) instructions on how I can do this - or advise what books I should look for? I’m not completely sure what you are looking for as there are different top edges on korowai but I think you may be wanting to do a tāniko border. There are a couple of books that I show on my Reviews page which have tāniko patterns in them. My book Weaving Flowers from New Zealand Flax has clear photos and instructions for weaving flowers, or putiputi. You can purchase it directly from me and all the information about how to buy it is on the Book page of this website. People tell me they can follow the instructions easily so hopefully you’ll find it the same. Also on the Reviews page of this website there’s information about books which have kete making in them. Some are still available to buy from bookshops and others are out of print and so only available through your local library. Good luck with your weaving! wonderful book “Weaving Flowers” It is great. I just want to ask you if you would mind telling me where I can find step by step diagrams and instructions on how to make a Kete whiri Pikau, the one that has a double whiri on the bottom, also a flat bottom kete - the one that you do a tapiki rua when you have completed the 1st 3 rows and then turn your kete over and continue weaving from the inside of the kete. Thanks for your kind comments about the book. There is information for weaving different types of kete in some of the books listed on the Reviews page of this web site which may be able to help you. I would like to make a sun visor hat with flax. I suggest you weave a flax strip and then make the visor by extending the strip out to one side for the length of the peak of the visor. Hi Ali, You have a great site. I was interested in having a go at making a traditional cray pot. Do you know of anyone who can help. Cray pots are attractive items aren’t they, as well as being useful! I’ve looked at them myself and thought they would be an interesting thing to make. * Te Papa has some information on how John Phillip Puketapu, a kaumātua (elder) from Taranaki Whānui ki Te Upoko o Te Ika, has made cray pots. * The book, The Coming of the Maori by Te Rangi Hiroa, which I show on my Reviews page, has some information on construction techniques for fish traps. It would also be worthwhile going to your local museum to see if they have any samples of traditional cray pots that you can study for their construction techniques. Good luck with your project! Do send me a photo of your completed cray pot if you get the chance. I’d love to see it. My book Weaving Flowers from New Zealand Flax (second edition) is $36 including postage and packaging. All the information about paying and postage options are on the Book page of this web site. I don’t currently have written instructions for making a kete. However, my next book will include instructions for weaving baskets. The book won’t be available for a while yet, but keep an eye on my blog for updates on progress. Firstly, hope you and your family are ok after the earthqauake, secondly thank you for a great book and update info. In response to Toni’s query about craypots, there is a woman in Invercargill/Bluff whoose father used to make them and she gave a demonstration last year at the museum. If you would like to pass my email address on to Toni I will follow this up for her. Recently I have had some odd experiences with dyeing - was using Teri dyes (mainly red & black) and they were coming out with an almost oil slick rainbow finish or a metallic gold tinge, but dried look dull and not very attractive, will flick a note to Teri dyes to see if they have any ideas on this. i used my usual pots, harakeke sources etc. Once again a big thankyou for your great work. Thank you for your thoughts and kind wishes. My family are all safe and well although my house has been badly damaged. Luckily we are able to stay with one of our sons in the meantime. It’s been gratifying to receive support from the weaving community throughout New Zealand. Thanks for the information about the craypots. I’ll let Toni know your email address. Interesting to hear about the dye effect you’ve been having. I’d be interested to hear David from Teri dyes thoughts on this. Do let me know when you hear from him. As you mention that the flax is drying to a dull finish, it sounds as if the wax in the flax has been affected in some way, doesn’t it? Tino pai te panui i nga papapatai me nga korero e pa ana ki te raranga kete. Yes great site! My problem is clear images and instructions (that actually make sense) when it comes to making a simple kono….I have found one site - Te Ao Hou that has instructions but half way through I get lost….any ideas or help? Apart from the instructions at Te Ao Hou, the book Fun with Flax also has instructions for weaving a rourou or kono. If you are still having problems, it’s sometimes useful to get another person to look at the instructions and work them out with you. Good luck! Kia Ora Ali, I just happened on this site as I was looking for some instructions to join whariki..the pattern wouldnt matter, just the basic join. What a helpful website. The New Zealand Electronic Text Centre has an electronic version of Te Rangi Hiroa’s book The Coming of the Māori on-line. In section 4, “Mats, Baskets and Plaiting”, there is an illustration of one method of joining pandanus and there are illustrations of more techniques here. They can all be used for harakeke. Mats can also be joined by plaiting the ends of the strips together. how do you finish off weaving mats? I am doing a project of making a mini waka and so I have to make a mini mat as well. At the moment, I don’t know how to finish off. The electronic version of Te Rangi Hiroa’s book The Coming of the Māori, which the New Zealand Electronic Text Centre has on-line, has a number of illustrations of various techniques. There are instructions on how to finish off a mat here and how to finish off a pandanus mat here. Both versions can be used with flax. I have your beautiful book. I am interested in a simple 2 corner kete,I have read a few books about kete but tthe kete is plaited then weaved and turned in the right way,do you have any intructions for the 2 corner kete. I have been waiting for a order of your book ” Weaving flowers from nz flax” and have not had any luck for the last month so yes i will be ordering direct from you and think they are beautiful. I have only started weaving kete and the only way i know is starting in the middle you could say and then plaiting the bottom is the last thing before turning it inside out. Im sitting my Bach of Education (Primary), and for visual art one of our assignments is to do a 3d composition picture which should consist of fish/s, shell/s and a taonga. I thought of KETE straight away for my taonga. on the internet i came across this kete and took an eye to it. The weave is the KUPENGA weave and wanted to know if you know this weave can you teach it to me over line as i thought it is a gift that maori had learned years ago on how to catch fish etc and because it being a fish/ shellfish theme that kupenga kete will truly fit in my poster, in saying that i wanted to weave a little one to actually stick on my poster. A kete made with the kupenga weave is started with a flax plait with strips being added at small intervals. The strips are then woven up uisng a fisherman’s-type weave. You can see the basic construction in this You Tube video by Katarina Tawiri. If you haven’t started with a woven plait before, then the book Te Mahi Kete: Maori Flaxcraft for Beginners has instructions in it. You should be able to get this at your local library. Hi im trying to make a korowai for when i graduate in a year.. So would like to know if i am supposed o use like a mat weaved out of flax or does have to be a bit more flexible?? The book Weaving a Kakahu by Diggeress Te Kanawa shows in detail how to make a cloak. It has recently been reprinted and is available from Tu Mai or your local library should have a copy. Good luck with your project! Just a quick thankyou for your wonderful website and the second book you sent me on how to make large flax containers. You have been an inspiraton to me and my friends your website is amazing and the sharing of your work. Would you be able to show what a lockdown of weaving is,I am not sure if it is the same as your kete edging. There seems to be a number of lockdowns for finishing flax work. Would appreciate your response. Kia 0ra Ali what a beautiful book of putiputi weaving i so enjoy making the putiputi.